My friend Mary Lou died. I would like to write about her here, about what a good friend she was, about all the things she taught me, about what a generous, beautiful, life affirming energy she was in the world . . . I’ve tried to write about those things, but so far, I haven’t been able to do it. For now, let me just say that I miss her very much. In looking for some way to adjust to life without Mary Lou, it occurred to me to ask her husband, Tom, about her spinning wheel. I can see her sitting at it, spinning and laughing and listening, barefoot, happy, at ease as only she could be with the wheel and the world. Seriously, she was so good at living. Tom was kind enough to let me bring Mary Lou’s wheel home with me. It’s here with me now, and it does help. 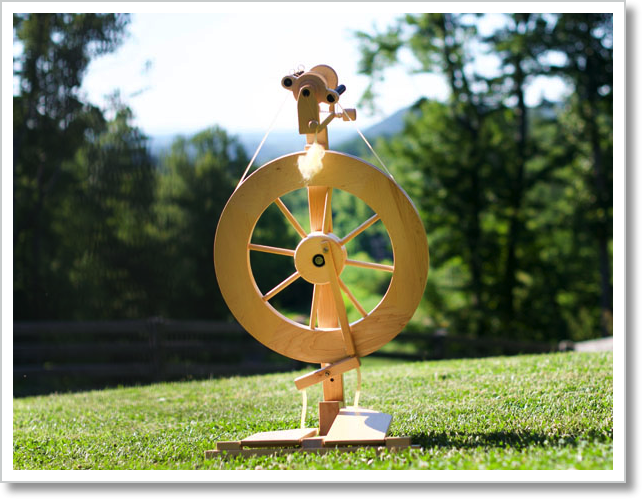 I am spinning on it for this year’s Tour de Fleece which started yesterday. My plan is to spin this glorious BFL top that for some reason makes me think of Mary Lou. I want to use the 2-ply yarn to knit a pair of socks. I think she would like that. She was extraordinary. I am so thankful that our lives intersected for awhile.